Days in Florence are full and rich in art and history, but in this city of stone it is difficult to find the soothing color of green provided by plants and trees. After a week in Florence you may wish to rent a car and take off for the Chianti Classico Region. Only minutes out of the historic center you will find the first olive groves and vineyards. 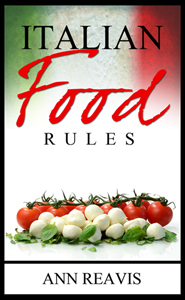 This is Tuscan Traveler’s favorite day in Chianti. You should start out by 9:00am. Leave Florence via Porta Romana. At Porta Romana (traffic circle with “Headache Lady” statue in center) follow “Siena” and “Galluzzo” signs. Once you get to the suburb Galluzzo, follow the signs to “Siena” and “Greve” (sometimes you will see one town named, sometimes both). As you leave Galluzzo, you will see a large monastery, Certosa, on a hill in front of you. Watch for the sign to “Siena” and take a left. After the left turn, you will cross a bridge built by the U.S. Army Corps of Engineers during WWII after the Germans blew up the bridge to slow the Allies’ advance on Florence. You will now have a better view of the Certosa Monastery on your right. Certosa di Firenze (Florence Charterhouse) was one of the most powerful Carthusian monasteries in Europe and exhibited, until Napoleon’s spoliation, 500 works of art. The building was erected on Monte Acuto, a low ridge south of Florence, financed by Niccolò Acciaioli, a powerful Florentine citizen who commissioned it in 1341 with the aim of creating both a religious center and a school. In the past, the Certosa was famous for its lavish library. The monastery is open every morning and afternoon for a few hours (except for Mondays) for group visits (in Italian) in the company of a lay brother acting as guide. Once the home of hundreds, there are only a few monks living at the monastery now. The monastery is still alive as a religious community, even if the original Carthusian order departed in the 1950s. The Cistercian order has lived in the monastery since then, restoring many areas. Donations from the tours help maintain their enclosed monastic life as well as the monastery itself. After the round-about, you will travel through Tavarnuzze and continue until you see a river on your right and then, green lawns. Slow down and look for a gate with a sign that reads “American Cemetery of Florence”. Drive through the gate (there are two entrances, so if you miss the first one, use the second). Go to the center of the curve drive and then drive straight through the entrance between the two small offices. Head over the river and at the flagpole turn right and follow the signs left up the hill to the very top. There is a parking lot (and great bathrooms). Get out and walk around. The headstones of 4,402 of American military dead of World War II are set in symmetrical curved rows upon the hillside. They represent 39 percent of the U.S. Fifth Army burials originally made between Rome and the Alps. Most died in the fighting that occurred after the capture of Rome in June 1944. Included among them are casualties of the heavy fighting in the Apennines Mountains shortly before the war’s end. On May 2, 1945 the enemy troops in northern Italy surrendered. Above the graves, on the topmost of three broad terraces, stands the memorial marked by a tall pylon surmounted by a large sculptured figure. The memorial has two open atria, or courts, joined by the Tablets of the Missing upon which are inscribed 1,409 names. The atrium at the south end serves as a forecourt to the chapel, which is decorated with marble and mosaic. 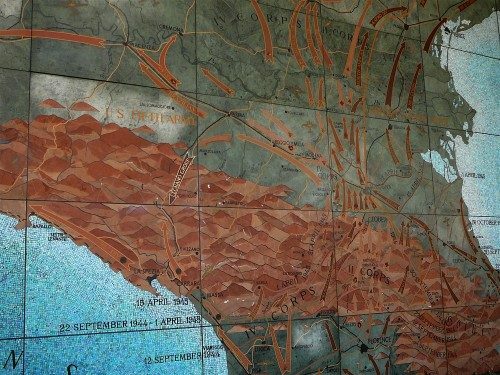 The north atrium contains the marble operations maps recording the advance of the American armed forces in this region. Walk around the grave sites – the marble was quarried near the Austrian border because the whitest marble comes from there. Notice the classic Chianti view of the town of Impruneta on the opposite ridge. As you leave the cemetery, turn right onto the main road and drive through the towns of Il Ferrone and Passo dei Pecorai. Always look for signs the say “Greve”. There will be one place, soon after the cemetery, where on a soft curve you cross the oncoming lane of traffic to go straight, following the Greve and Il Ferrone signs. This is an area of clay pits and terracotta ovens. You will see lots of pots and floor or roof terracotta tiles piled high. Follow the road on to Greve. Before you get to Greve you will see the Verrazzano winery roadside tasting room in the hamlet of Greti. Remember this spot because you will come back to it later in the day. Once on the road to Montefioralle, go straight for a bit and then the road narrows and you climb the hill. Remember to go slow because it is a two-way road. The road winds up the hill through an olive grove. Notice how the olive trees are like bushes. You may even be able to see the stumps near the ground where they were cut off in 1985 after a hard freeze that killed the wood, but not the roots. The trees were sawed down, but new branches grew from the stumps to make these odd short three- or four-trunked olive trees. Montefioralle is the best preserved medieval walled hill town in Tuscany. Start your tour at the end of the parking lot near the newly-restored tower gate, just up the slope from the stoplight. Walk along the village street that circles between the two walls. 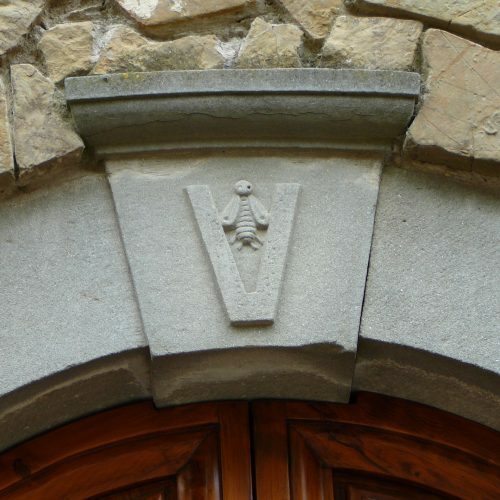 About five doors along the walk look for a design above the door with a V and a bumble bee. This is one of the homes of Amerigo Vespucci, who was a mapmaker in the 1400s and gave his name to America. Amerigo Vespucci was born (1454) and raised in Florence. In March 1492, the Medici dispatched the thirty-eight-year-old Vespucci as confidential agent to look into the Medici branch office in Cádiz, Spain. In April 1495, the Crown of Castile broke their monopoly deal with Christopher Columbus and began handing out licenses to other navigators for the West Indies. Vespucci first worked as a provision contractor for Indies expeditions and then, became an explorer, navigator and the cartographer, who first demonstrated that Brazil and the West Indies did not represent Asia’s eastern outskirts as initially conjectured from Columbus’ voyages, but instead constituted an entirely separate landmass, hitherto unknown to Europeans. Colloquially referred to as the New World, this second super continent came to be termed ‘America’ on Vespucci’s maps, deriving its name from Americus, the Latin version of his first name. 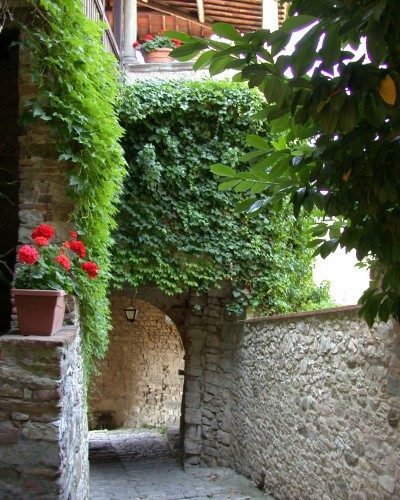 Enjoy the “Kodak moments” of Montefioralle. Be sure to walk a ways down each of the small alleys that branch off the main village road – there are great views to be seen. If you aren’t allowed to drive into the main piazza then turn left at that same stop light and go across a bridge and turn right into the big parking lot. (I think it is free, but look around for a toll machine or an attendant.) Walk back to the main piazza with the statue of Giovanni da Verrazzano (another local boy who became an explorer) and tour the shops around it. It’s lunchtime! 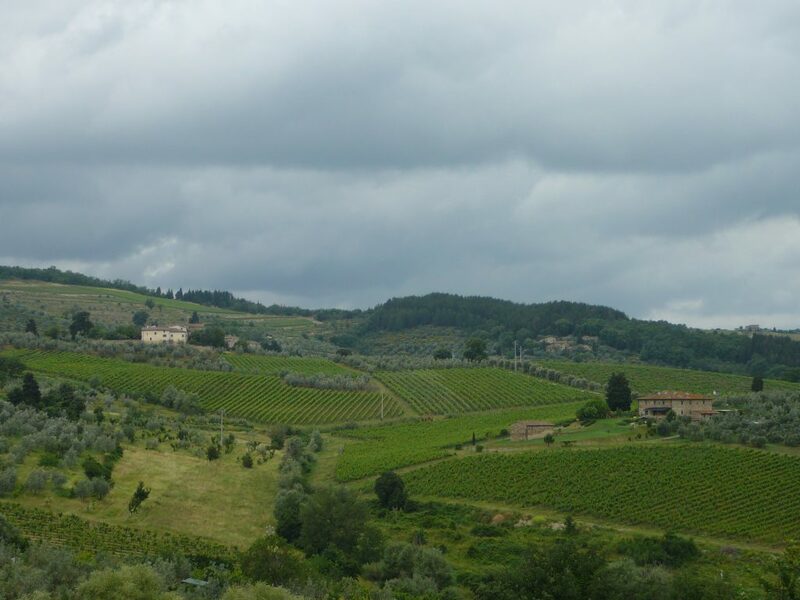 Find Tuscan traveler’s Best Day in Chianti Classico Region, Part Two. Via Senese also SS 2? Grazie. SR222 (Strada del Vino) runs through Greve and Panzano to Castellina. SR2 (Via Senese) runs from Florence through Poggibonsi to Siena. They may share some road near Florence and near Siena.